This state park is one of the best birding sites in the state and boasts a bird checklist of over 260 species. 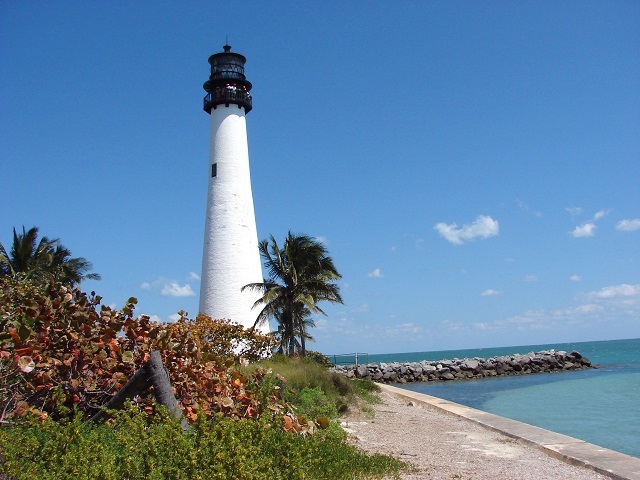 The park occupies the southern tip of Key Biscayne and is a critical stopover point for migratory birds in the spring and fall. Over 30 species of wood-warbler have been recorded in the park during migration including many sought after species such as Blackpoll, Bay-breasted, Cerulean and Swainson’s. In summer, Gray Kingbirds breed here and Magnificent Frigatebirds soar overhead. In winter, shorebirds like Wilson’s Plovers ply the beachfront. Like many other urban oases in Miam-Dade County this park has attracted many rarities including Red-footed Booby, Great Cormorant, Ruddy Quail-Dove (1st and only state record), Key West Quail-Dove, La Sagra’s Flycatcher, Thick-billed Vireo, Bahama Mockingbird, MacGillivray’s Warbler, Bananaquit, Black-faced Grassquit, and Western Spindalis. Beachgoers can be plentiful on weekends in sunny weather, but the nature trails are relatively untraveled.